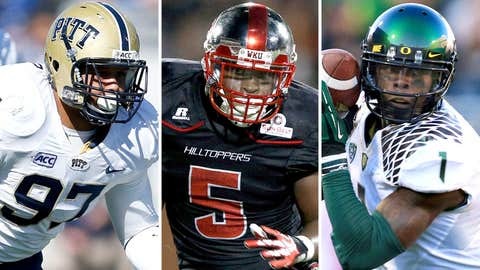 Aaron Donal, Antonio Andrews and Josh Huff were among the most impressive in Senior Bowl workouts. MOBILE, Ala. — You can watch football players on TV or on game film during the season, but you do not develop a true appreciation of just how quick, fast, big, strong and dominant some of them are until you see them in person. At Senior Bowl practices this week, several players’ pure physical skills jumped out immediately to those in attendance. So to put a cap on Senior Bowl week, here are the 10 best “skills” I saw in practice during my time in Mobile. Former Washington Redskins and Houston Texans general manager Charlie Casserly made a great point to me about Sutton. He said that it appeared Sutton’s range of effectiveness was limited. I agree with him. At 315 pounds, Sutton is too heavy and lost his ability to make plays 3-5 yards in the backfield like he did during the 2012 season when he tallied 13 sacks and was tops in the nation in tackles for loss. But he still has a tremendous first step, and that sudden explosiveness is a great asset for an interior defensive lineman. If he sheds some excess weight, he’ll take better advantage of that first-step gift and be much more productive. Paired with great patience, it was evident that Andrews received good coaching at Western Kentucky. When the defense was in an over front, Andrews read the three-technique to determine whether or not he should push strong-side runs into the A-gap (between the center and guard) or if he should push it out to the C-gap (between the tackle and tight end). He also showed an uncanny ability to see, or feel, the backside cutback lanes open up and on occasion bounce outside if the defensive end lost contain. Solid, stout and quick, Donald moves like Sutton did during his 2012 campaign. Although he is only 288 pounds, Donald is able to become an oak tree and anchor himself when fighting double teams because of his powerful lower body. His upper-body strength is impressive, too. With great bend and ability to play low and quick, he shoots his hands, gets up under the pads of offensive linemen and powers them with great leverage. The linebackers coach for the North team told me that he snuck past the film room after weigh-ins on the first day of activities, and he took note that Borland studied film for an hour. Borland wanted to get a better grasp of the defense the Atlanta Falcons coaches ran so he could perform well in practices. It worked. Borland may be undersized at 5-foot-11, but he consistently weaved his way through blocking schemes to attack running backs and showed quickness and range in his zone drops in pass coverage. You do not often see linebackers of Borland’s height playing on Sundays, but the NFL is ready for another Zach Thomas or Dat Nguyen. Westbrooks is disciplined with his eyes after his initial three-step read, and his ability to keep his pads over the balls of his feet while backpedaling allows him to make smooth transitions and efficient breaks on the ball. While Nebraska’s Stanley Jean-Baptiste was impressive in press coverage, he seems to be still learning and getting more comfortable playing off the receiver. Westbrooks (6-0, 192) seemed to be the most well-rounded cover corner based on the practices I saw. Richburg shows a suddenness and quickness that is unmatched by any other offensive lineman in Mobile. He has been matched up against Donald on many occasions in practices, fairing extremely well, and a big reason for his success is his footwork. Good coaching and natural ability shine out of the Ram. Alge Crumpler, a former first-round draft pick as a tight end, sat in many offensive meeting rooms in his 10-year NFL career. He knows a good offensive lineman when he sees one. Richburg was the kid he told me to keep an eye on at the Senior Bowl, and he was right. Huff may be the most fluid athlete at the Senior Bowl. He shakes past, slips around and jumps over defenders, spinning, twisting and dashing with ease. While Mike Davis of Texas, Jordan Matthews of Vanderbilt and several other receivers stood out, I talked to several scouts who thought Huff was the most impressive of the bunch. The only knock I saw on Huff was his tendency to catch the ball with his body. He does not have to — he showed he can catch the ball away from his body – and it is certainly a bad habit he will have to break at the next level. Only 5-8 and 193 pounds, Herron may be part feline. That kid is as quick as a cat. He made corners whiff on several occasions as they tried to jam him off the line of scrimmage while in press coverage. When defenders were in the off position, his cuts in and out of breaks on routes were sharp and sudden. Herron will make a solid slot receiver in the NFL. He may not have the fastest 40-yard dash time of the bunch, but without much wasted motion, Abbrederis’ routes are efficient and extremely difficult for defensive backs to read. If a defensive back is undisciplined with his eyes and gets caught peeking at the quarterback, the 6-foot, 189-pound Badger will make him look silly. I watched him run one route that was a double move, and he actually made the defensive back spin around twice. This guy was impressive all season in the Big Ten, and he was consistent in Mobile. Carr showed his arm strength in Tuesday’s practice when there was a fierce wind whipping across the field at Ladd-Peebles Stadium. While other quarterbacks’ passes either sailed or fluttered on occasion, Carr’s darts cut and whistled through the elements to his targets consistently. More than other quarterbacks’ passes, there was more pop and snap in the hands of receivers who caught passes from Carr. When NFL teams dig in on Carr leading up to the draft, that’s one attribute that will shine in his favor. Coy Wire is a college football analyst for FOX Sports 1 and writes CFB and NFL for FOXSports.com. He played college ball at Stanford before a nine-year NFL career with Buffalo and Atlanta. Follow him on Twitter @CoyWire.